Spot On. Not everyone will agree, but if you must, just hike the gas tax again. I especially like the provision to study public-private partnerships. With all that expected cash, I think the State could manage a toll road and keep the cash. How much did the State get from the current Toll Road in 2016 or 2017? Also, with a gas tax, there is no privatizing necessary. If you must collect a tax, at least 100% of the funding back to the residents. Your subject of taxes is rather timely given the expose of the Paradise Papers. The Paradise Papers reveal a complex shell game among Billionaires, the Rich and Famous and Multi-National Corporations to hide their earnings to avoid taxes. All this is aided and abetted by elected politicians. Bernie Sanders has said, “The offshore tax dodging uncovered by the International Consortium of Investigative Journalists (ICIJ) in the ‘Paradise Papers’ raise serious questions about the integrity of our tax system and the ability of the top one percent to rig it in order to benefit themselves at the expense of everyone else,” the independent Senator from Vermont says in the letter. We witness the micro effects of this shell game here in Marion County. The Colts and Pacers have stadiums built for them from tax dollars but the taxes are "laundered" through the CIB. Both political parties (Republicrats) join hands in a circle and become enablers of Crony-Capitalism. State wide some companies receive tax abatement's, etc., but the vast majority of businesses do not. 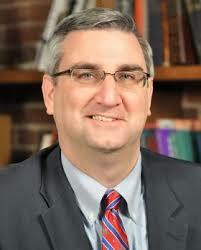 Holcomb is simply a taller version of Mitch Daniels. Both have inferiority complexes, both are lousy governors with vastly superior Lieutenant Governor’s, and they are both off their rockers.